Home Home Furnishing Vibrant Kitchen Color Ideas - Paint it Right! Vibrant Kitchen Color Ideas - Paint it Right! Do you wish to repaint your kitchen to render it a unique and amazing feel? If yes, then you probably might be anxious to choose the apt colors for your kitchen. You ought to know that choosing the right color is quite imperative when thinking to redesign your kitchen, as it helps to set the perfect tone and look for your kitchen. In fact, selecting the apt color will render utmost pleasure to you while working in the kitchen for years to come as well as to the visitors or guests. Black: Black is generally linked with despair and darkness. It also is linked to bereavement at times and thus, you need to think twice prior to using black color for your kitchen. In addition, black absorbs the light in a room and thus, think extensively before you choose this color for your kitchen. White: Almost contradictory to black, white can reflect around 85% of the light in a room. This color makes the room appear larger and radiant. Unfortunately, white colored walls are extremely prone to visible markings and scrapings. Further, it will not blend well with your food lying around. Red: Dark tones of red form a warm ambience. This color also is energizing and stimulating thus, may be quite vibrant and exciting for your kitchen. This is because your kitchen is the most interesting place in the home, wherein you cook awesome recipes and cuisines for you and your family. Bright shaded red might counterbalance the neutral shades and can add a tinge of excitement. Orange: Characteristics of orange color are quite similar to those of red and might work great for a kitchen. The brighter the shade is, the livelier your kitchen will be. 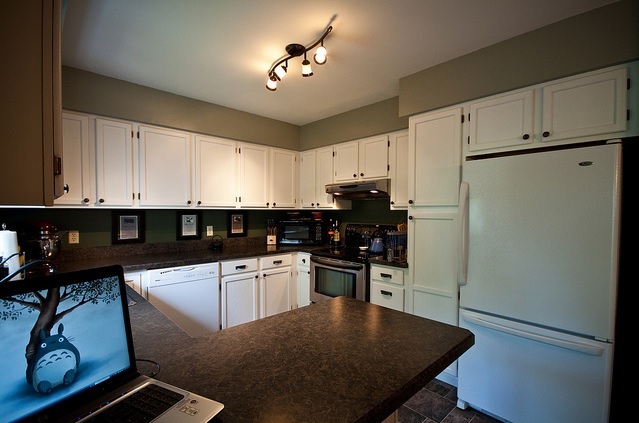 On the other hand, soft toned orange color tends to make the kitchen appear inviting and warm. Green: Green works great to stabilize orange and red. For kitchens, dark tone of green might work similar to black. Thus, it is best to avoid dark shades of greens and stick to lighter tones of green. Blue: It is believed that blue color works best to calm a person’s nervous system. It can soften brighter rooms, but not often utilized in kitchens. Alike green, if you use a darker tone of blue, you may get the same effect that you would get with black. Light colored blue tones give out a comfy and serene ambience. Yellow: It is an excellent color and is often utilized in kitchens. In fact, yellow is an invigorating and jolly color. Light shades of yellow work best to make a kitchen appear larger. In fact, yellow is a highly influential color, but make sure that you avoid overdoing it. These are a few color ideas to make your kitchen appear vibrant and lively. So, weigh your preferences and choose a color accordingly. Manoj Goure is a writer who creates his unique blogs posts. Most of the articles written by him are related to home decor and he works at RugsandBlinds.com.